Following the 4-1 defeat of Cultural Leonesa in the Copa del Rey, Ernesto Valverde and his squad got straight back to work on Thursday morning. There’s a job to do, and there’s not much time to get ready for it. Saturday brings the local derby with Espanyol. Arthur, Luis Suárez and Sergi Samper all joined what was a warm-down session for the players that featured at Camp Nou the night before. Arturo Vidal, who had to skip the game with a fever, was also back with the group. 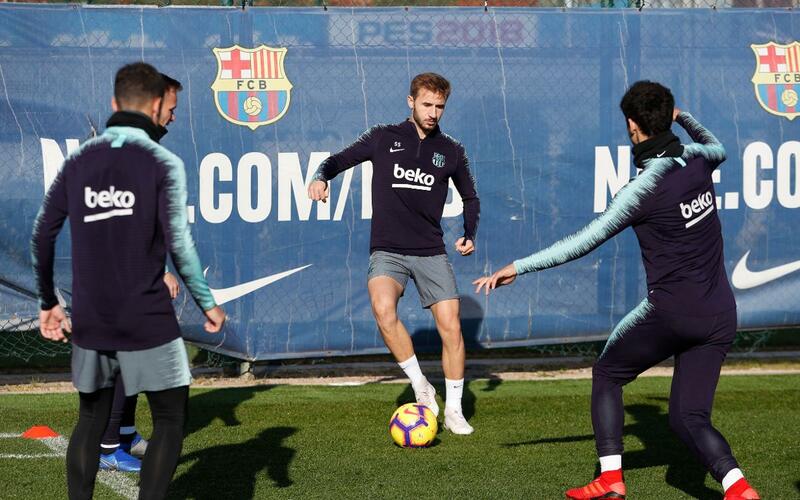 Sergi Roberto emerged on a separate part of pitch 2 at the Ciutat Esportiva as he battles his way back from injury, while Iñaki Peña, Chumi, Juan Miranda and Riqui Puig of Barça B also joined the throng. The squad have just one more training session between now and the game. That’s at 6.00pm CET on Friday. An hour before, at 5.00pm CET, you’ll be able to listen to Ernesto Valverde speaking at a media conference that we’ll be streaming live on this website with English translation. It was a special morning for Leo Messi, who was presented with the Memorial Aldo Rovira player of the season award for 2018/19. The winner is chosen by a jury formed by directors and heads of sport of different media companies in Catalonia.